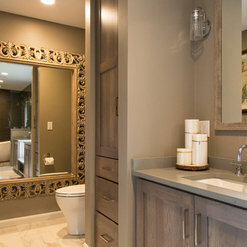 Our projects range from a beautiful new kitchen or master bath to complete custom homes provided fully furnished. Refined Renovations planned and executed our renovation beautifully. They helped us to determine scope and priorities (with future projects in mind), as well as steer us to a beautiful design. They excel at taking your ideas, pictures -- and random musings -- and turning it into a beautiful, functional space. Icing on the cake: we didn't have to worry about managing contractors, subcontractors, etc., because they handle everything. With a busy job, young kids, and travel, we couldn't have gotten it all done on our own, and it certainly would have never turned out as beautiful as it did! We highly recommend the Refined Renovations team! Hi Liz - we are so happy you moved to Andover! We so enjoy working with with you and love the way it turned out! Thank you so much for your review! The Refined Renovations team really listened to us from what we wanted to what would work within our house. They held to the schedule that was agreed to up front, when WE decided to make changes we knew what the cost would be so there were no surprises. We were so happy with the work done on our first floor (change in flow, kitchen, master bedroom) that we are planning on having them back next fall to redo our second floor and large family room. They run their business like a business and not like what people expect from the builder/contractor industry. The team was a pleasure to work with and we look forward to partnering with them again next year to complete our house. Thank you for taking the time to review us Linda! 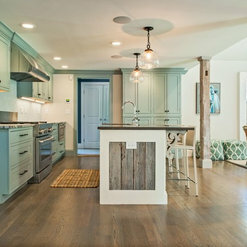 What a dramatic change to your home! Stunning! We approached Refined Renovations about replacing our existing exterior lighting, the lighting in our kitchen and dining room and dining room furniture. Kimberley picked out the most amazing fixtures and furniture and we could not be more happy. The process was smooth and efficient. Kimberley could not have been more responsive and helpful. We highly recommend her and Refined Renovations. Broadly speaking, the single best endorsement I can provide to the team at Refined Renovations is that we were completely comfortable living (temporarily) 2,000 miles away from home for 6 months once ground was broken on a fairly significant home redesign - relying heavily on the team to make decisions where required and clearly communicate to us when additional input was required. The pre-planning Jim and his team walked us through, the thoroughness and thoughtfulness from the very onset and our complete confidence in the quality of the team's work gave us a level of comfort from two-thirds of the way across the country that I don't imagine could be matched by many firms. There was never a shortage of friends, family or acquaintances expressing their disbelief that we could "rest easy" from that far away on a project of this size and scope. 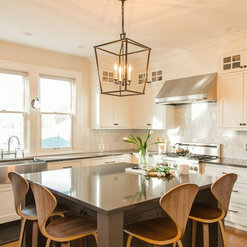 For us, there was never a question - as we got to know the whole team and went through the planning process with them we quickly recognized that Refined Renovations was not like most other firms and we could rely wholly on their skills and expertise both during the decision making process as well as throughout the work to follow. 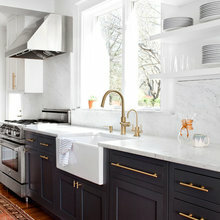 Beyond that, however, I think a number of things set Refined Renovations apart and are worth mentioning specifically for the benefit of anyone considering their services: 1. The design phase is the definition of genuine and thorough collaboration. We came in with a very well thought out and fairly specific "plan" for home our home's expansion and the Refined team never wavered from the core aims we hoped to achieve. But they were able to expertly weave in considerations that hadn't occurred to us (as a knowledgeable contractor should) and, perhaps more importantly, begin to push us out of our comfort zones (especially Kristin and Kimberley) on things ranging from simple wall accents all the way to floor plans. The end result is that we came home only days ago to a home that exceeded our expectations. We saw in areas where they pushed us outside of our comfort zone how happy we were to have had a bit of faith in the process, and also saw all of our overarching hopes for the remodel had come to fruition. 2. There may well be some potential customers that prefer to have separation between the construction team, the interior design group and the other moving parts. I can absolutely understand that tendency in certain situations but for us one of the most appealing aspects of Refined Renovations was the degree to which the whole process was guided by a single team having worked together so well for so long. As aspects of the floor plans changed or were debated and finishes finalized, the individuals working on color palettes, furniture selection, etc. were right alongside for the discussions and were able to seamlessly account for and incorporate all of those considerations into a final product. It also gave us an easy point of contact for any and all of our scattered questions throughout the process – an especially valuable benefit from afar as we never had to wonder how to coordinate between multiple teams once a decision was made. If a fully integrated team that can handle everything from foundation to furniture is important to you then I can’t recommend Refined Renovations enough. 3. And, finally, perhaps the sweetest words a customer can hear – on time, on budget. The planning process sets a reasonably detailed budget, and any adjustments up for consideration throughout the process come with clear options for consideration and an associated price as well as timeline impact for each. With regards to timing, Refined Renovations was working with a fairly definitive day on which we would be out of the house and a fairly definitive day on which we’d have to return. With four kids in tow we had limited flexibility to jump in and out of living situations or adjust on either end in terms of dates. Throughout the entirety of the process they tailored certain aspects of the schedule and cadence of events to fit our somewhat unique and inflexible needs – it was definitely appreciated! Without exception every single person we encountered as part of the project was friendly, transparent, professional and fully qualified to assist us with this undertaking. We could not be happier with how everything turned out. Dan - this review was incredibly heartfelt. Thank you so much for taking the time to compose such a thoughtful piece! We are so happy we were able to give you the home you wanted..."from foundations to furnishings"...I love that line! We were astounded at how incredible our space turned out; thank you Jim and Kimberley, for your vision, your professionalism and your outstanding service! We couldn’t be more pleased with our recent experience hiring Refined Renovations soon after purchasing a home that, while it had great “bones”, needed an inspired vision to turn it into the contemporary/farmhouse I saw in my mind. Minutes after touring our new home, Jim saw possibilities we hadn’t even imagined, and it was obvious we had made the right choice. What really stood out to us was how Jim’s Plan eliminated wasted space and created a whole new fresh design, still within the footprint of the house. Our renovation involved primarily the first floor, including Kitchen, Pantry, Living Room, Master Bedroom/ Bath/ Sitting Room Suite, Powder Room, & Laundry. Working with his talented designer/ project manager Kristen was simply a joy. She was amazing, and helped us create a true chef’s kitchen, beautiful and yet so functional. Who knew shopping for granite could be Fun! Their contractor John, of Henehan Construction, and his team were wonderful also. John is an exceptional carpenter, whose work and attention to detail is outstanding. He went out of his way (and I KNOW it wasn’t easy!) to have the kitchen and living space finished so we could enjoy having our family gather there for the Holidays- we will always be grateful to him for that. We lived on the 2nd floor for 4 of the 5 months project, and his crew who came every day at 7am were unfailingly kind, respectful and always professional. All of his subs were top notch. Though our project “ended” a few months ago, our relationship with Jim, Kristen and John has not. They respond and address immediately any punch list items that come up, and are never too busy to answer questions. It’s obvious they stand behind the quality of their work 100%, and put their client’s satisfaction first. We could not be happier with our beautiful, home - and highly recommend Jim & his Team at Refined Renovations! We absolutely love the way your home came out and you were such a joy to work with! Thank you for giving us the opportunity to help turn your house into your dream home! 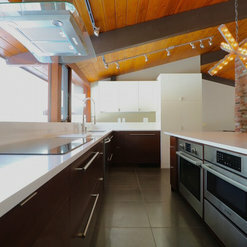 RR - Style Refinery provided a complete home renovation, interior design and decorating. The entire staff is very easy to work with and take a lot of pride in their work. The team has a wide range of expertise and talents Their approach and eye for style and beauty is tough to match. They are very accessible throughout the process. I would 100% recommend that you go with a more personalized and focused team at Refined Renovations. They exceeded our expectations and during the "reveal" day, we felt like we were on a TV show as we walked into the fully furnished home for the first time. We've interacted with the team so much, we feel like they've become our good friends and extension to our family. 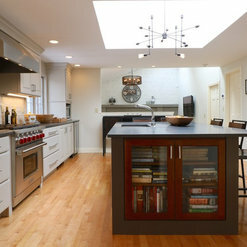 We have had a wonderful experience working with Refined Renovations/The Style Refinery. We had them remodel several areas of our home including our kitchen and bathrooms and we love how everything turned out. They are very easy to work with and always very responsive when we have questions. Highly recommend! 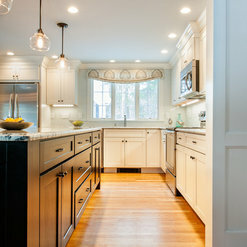 After interviewing several Boston-area design/build firms, we chose Refined Renovations to renovate several rooms in our home including the kitchen, mudroom, powder room, dining room, family room, butler's pantry and laundry room. Not only did they do the design and construction of the rooms, but we also worked with Kimberley on the interior design of those rooms and a few additional rooms. From the beginning, we had a tight timeline for when we wanted the project completed, and knew we could make decisions quickly to keep things moving as long as we found a company willing to do that also. Jim and Kristin agreed that our timeline was tight, but doable - they were the only company to give us assurance that they could get the job done in our timeframe. The design phase was a fun process due to Kristin and Jim truly understanding our challenges and then providing solutions that not only met, but exceeded our expectations. When we came to them with a suggestion for our pantry storage for example, they took that one step further and came up with an idea to make the space 10x better (and larger); something we never thought of. They didn't just do what we asked, they came up with better ideas. We had a wonderful contractor working in our home from demolition day until the final walk thru. John and his team were at our home almost every day. They are true professionals - skilled, conscientious, kind, stayed on schedule and kept us informed throughout the process. The subcontractors they worked with were excellent as well. Our project manager/designer, Kristin and interior designer, Kimberley, suggested materials and furnishings that really felt like "us." We created Houzz boards before the project started and they took those boards and made recommendations that reflected our style 100%. This made decision making a breeze. The budget was clearly outlined in the beginning and any changes to it were discussed immediately. Toward the end of the project, the team made sure we were completely satisfied with every aspect of our home. Post renovation touch-ups and follow-thru were completed swiftly and efficiently after we had moved in. We are beyond thrilled with our home. It is functional, comfortable and beautiful. 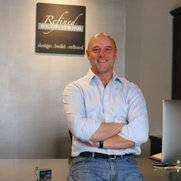 I would highly recommend Refined Renovations and hope we can work with them again in the future. Thanks for all the kind words Liz! Kimberly, Kristin and I loved working with you and Jason on your home. We were so excited that you love rich colors and weren't afraid to allow us to be a little bold with the overall design. Hope to work together again! 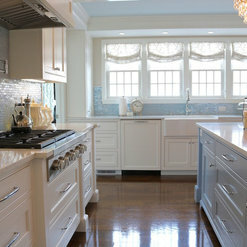 We had been considering a kitchen remodel for several years but had heard so many stories of kitchen remodel disasters! From day one, The Style Refinery eased all of our concerns. Our lead designer and project manager was Kristin McGrath. She was very creative with the space – we were not able to change the basic footprint of the kitchen, and it is a narrow room. Above all, we wanted a center island. Kristin is very knowledgeable (and patient!) and demonstrated that it would not suite the space. She suggested that we add a peninsula with an overhang for seating, which has worked out beautifully and gives us exactly the function and look we were going for. The cabinet quality far exceeded our expectations and the installation went very smoothly. Throughout the entire project, any concerns were handled quickly, which allowed us to remain positive and forward thinking. Kristin’s knowledge of the design process and her vision of the finished product are unmatched. 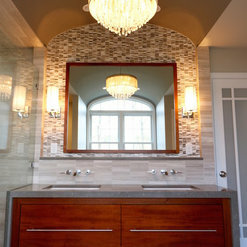 We will hire The Style Refinery and Kristin for our future remodeling projects! Thank you, Sue! 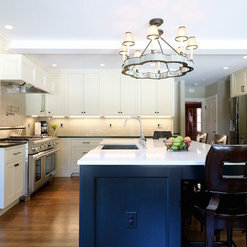 It was such pleasure helping to shape and design your new kitchen. I hope you enjoy it for years to come. 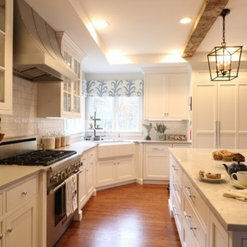 We selected the Style Refinery team to help us with our kitchen renovation, and we were very happy with our choice! The team was so good at the fine balancing act of listening to our goals and design ideas, and then steering us with their refined selections. The result is something that we absolutely love, but they clearly got us to a much more beautiful result than we ever imagined! We had some firm budget goals, and we feel that the price-to-value ratio of the result is perfect. The interactions with the entire team were extremely professional throughout. All of the construction, installation, and painting crews that the Style Refinery and Henehan Construction sent were outstanding. Timetables were met 100% of the time, and we truly appreciated that the team delivered on all of their commitments. In addition, we might add that Kristin was our main point person throughout the project, and she was absolutely fantastic. We just can't say enough nice things about the team! 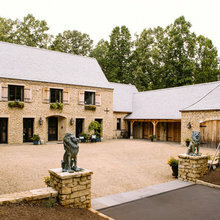 I primarily worked with Jim and Kim on designing my new home and couldn't be happier! Kim has a superb ability to understand my style and taste, while getting me to think out of my comfort zone. There hasn't been one thing that I went back to her on because I didn't like it! Both Jim and Kim are professional, easy-going, kind and a pleasure to work with. They're very conscientious and great at meeting deadlines, so I didn't have to worry. Refined Renovations and The Style Refinery is a quality company, with quality employees who will help you with whatever you need! I'm looking forward to working with them again in the future! Commented: Could you tell me where the light fixture is from?This chandelier was from the Candace Olson collection - Shelby Chandelier. Commented: I like the table.Looks cozy! How much space would I need for it?This is a 60&quot; round table to give you an idea of size. Commented: Can you tell me the source for the bar stools? Love the room.Thank you very much! We are an interior design firm with numerous trade vendors that we source from. Feel free to call, email, or reach out if you're looking for any design help! Commented: What is the color of the cabinets?Hi Yolanda. 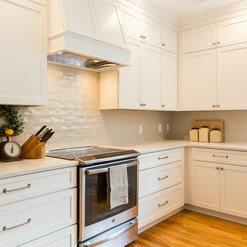 The cabinets are painted Ben Moore Simply White. Good luck! Commented: Paint colorHi Adrama - the wall color is Benjamin Moore Pale Oak. 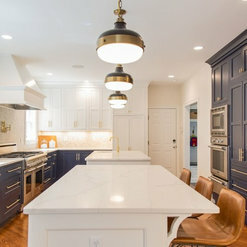 Commented: Are there two different granites here?Hi Claudia - yes, the main counter is a soap stone and the island is topped with absolute white. Good luck with your remodel!